I have been really enjoying making things out of polymer clay lately. 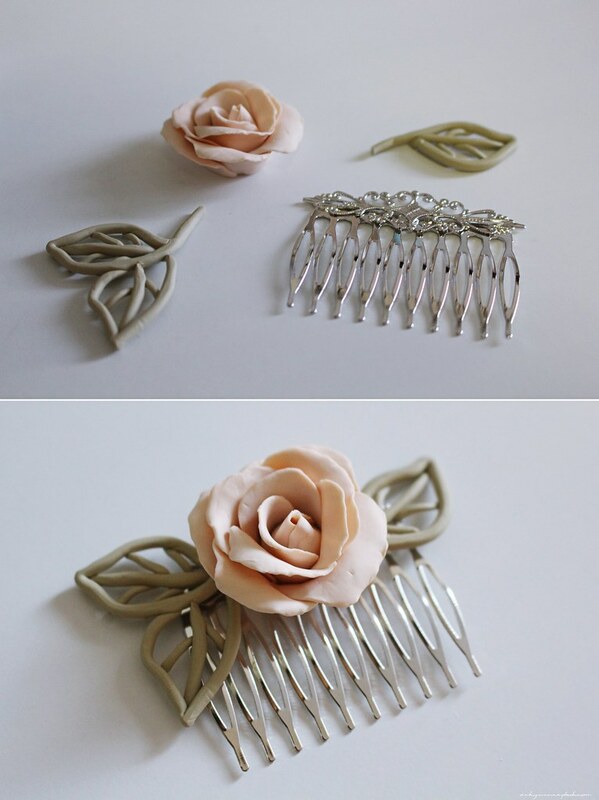 This time I challenged myself to making a rose; I’ve been very inspired by all the wedding accessories that I see on instagram and pinterest so I decided to attach the rose to a hair comb. I started by rolling flat a piece of polymer clay and rolled a piece into a sphere. Using a cap, I stamped multiple circles on it. Then I squished the edges of the circles so they start to resemble a rose petal; I tried not to make them too flat or else after I back them, it’ll break easily. With 2 pieces of the “petals” I wrapped it around the sphere into a cone shape. 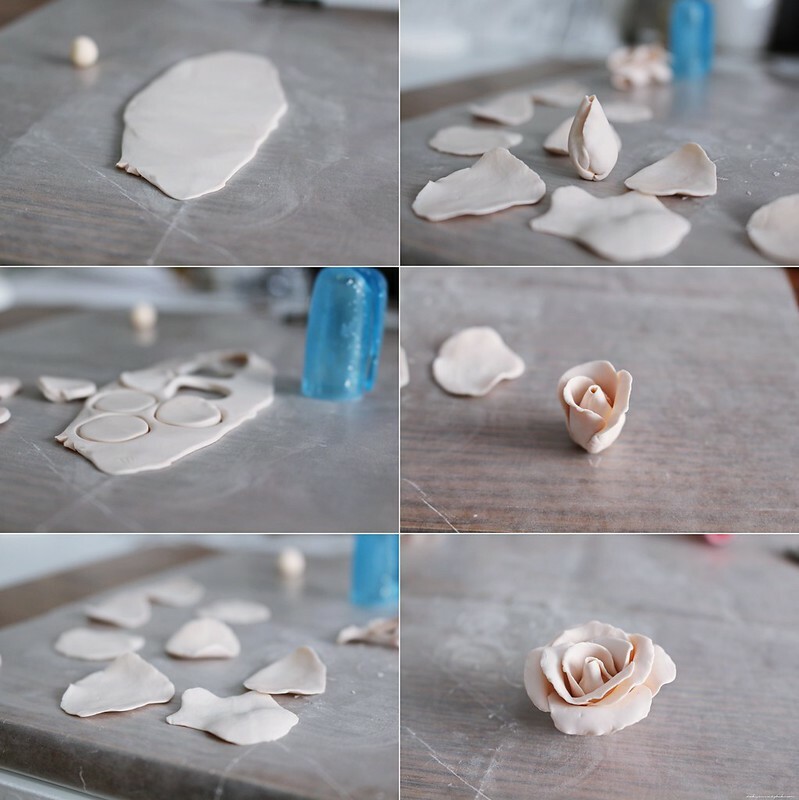 Then, as I keep adding the flat pieces around it, it starts to resemble a rose. If you only want to make a rose, you could stop there. But I wanted to attach it to a comb so to make it flat, I cut off the bottom. I also rolled green polymer clay into little worm like shapes and shaped them into leaves. Then, they are ready to be baked. After it’s baked, I glued them onto a comb using a hot glue gun. I did notice that it would’ve been easier if I had attached the leaves to the rose before baking… oh well, tips for next time. It’s now ready to be worn! I’m not very good with hair but it’ll do for now haha. These look so professional…it’s a wonder you don’t sell them as they are so lovely. Thank you Sue. I actually just put this up on Etsy! This is so pretty! 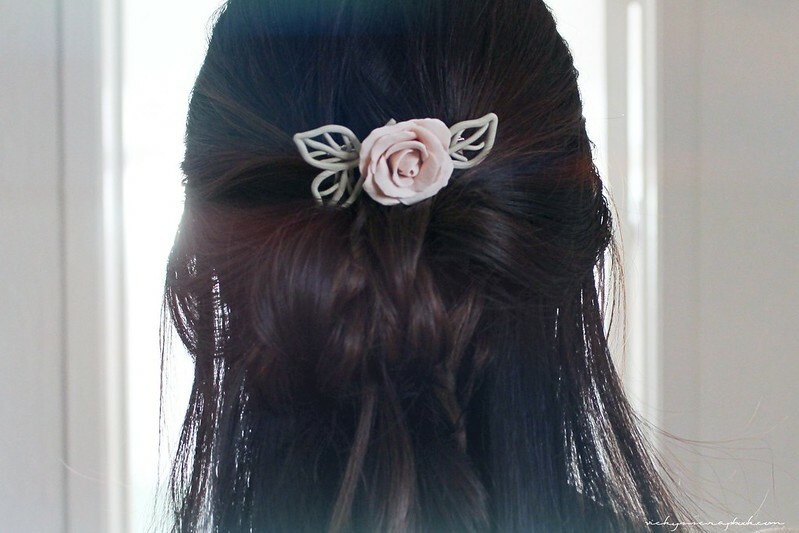 I can see it as a bridal accessory for bridesmaids! Haha you never know until you try! omg! so pretty!! perfect for spring! This is SO beautiful! You are such a talent!